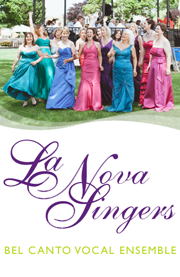 Reviews – La Nova Singers… Blog! What a glorious evening it proved to be. This female ensemble, 11-strong in this concert, sings superbly – and the harmonies were absolutely divine. Conducted and directed by Michelle Nova with piano accompaniment by Victor Burbidge, the programme ranged from the relatively unknown, such as Peter Warlock’s First Mercy and Grahame Kendrick’s Thorns in the Straw, the latter containing a beautiful, expressive solo from Rachel Scivier, to old favourites such as Silent Night and Jingle Bells. My particular favourites were the glorious – and hitherto completely unknown to me – Elgar song The Snow, with violin accompaniment from Anna Tyrrell and Hannah Scott, and Max Reger’s Cradle Slumber Song, but there was so much that was simply mouth-watering in this excellent concert. John Rutter’s cycle of six carols, Dancing Day; Little Drummer Boy – the boy in question being young Ben Watton, who played superbly despite being brought in at the eleventh hour; Chestnuts Roasting; The Twelve Days of Christmas; Winter Wonderland; Carol of the Bells; O Holy Night – I could have listened to it all over again. They sang like angels proving once again that the esteem in which they are held is totally justified. 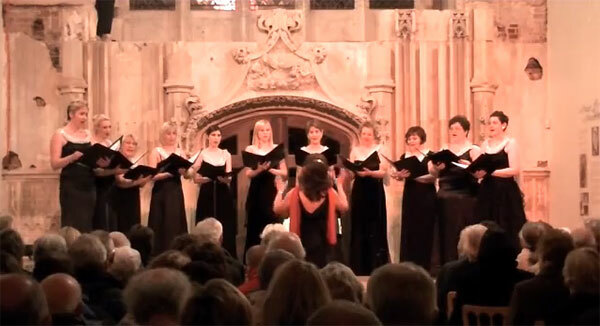 On a very cold evening in Beaulieu Abbey Church, the atmosphere sparkled as La Nova Singers performed a very varied programme of music from many centuries. Part of ‘Music at Beaulieu 2010’, this concert was on February 20th. The twelve ladies of the choir were totally focused on their director and conductor Michelle Nova, and they filled the Church with clear, glorious sound. Their diction is excellent. ‘Domine Fili’ from Vivaldi’s Gloria was one memorable item, as was the medley ‘Gershwin for Girls’; and the semi-staged Fairy Chorus from Mendelssohn’s ‘Midsummer Night’s Dream’ was magical; but all the items had their own special appeal. The very individual sound of this choir has to be the result of the Bel Canto technique taught by Michelle Nova, herself a fine soloist, as she demonstrated on the night. I wouldn’t have thought 12 ladies could have produced a transfixing performance of Handel’s ‘Hallelujah Chorus’—but they did. ‘When are they coming back?’ was the question asked by many as they left at the end. La Nova Singers gave Christmas concerts at various venues this year. West Cliff Baptist Church in Westbourne was well attended and the singers were so well received that they have been invited to give another concert later in the year. Highcliffe Castle was a sell out with people turning up on the night hoping to be able to buy a ticket. Unfortunately for them, they were unable to purchase any! THE weather was decidedly seasonal, and the castle’s imposing Great Hall proved to be the chilliest of venues – but cold extremities were soon forgotten at this most enjoyable concert in which voices, as always, were in perfect harmony and diction was clear as a bell. In fact the entire evening, which also included flute solos from Steve Howard and songs from guest soloist Roma Loukes, was an absolute pleasure to attend. Conductor and director Michelle Nova’s bubbly personality cast a warm glow over singers and audience alike as we listened to an eclectic range of Christmas songs which began with the eleven ladies holding lights and walking from the back of the hall onto the stage, singing – naturally- Torches. They ended almost as they began, with the singers donning lit-up fairy wings and headgear, and Michelle, complete with star-topped wand, conducting the opening chorus from Iolanthe, which was acted out extremely enthusiastically! In between we heard, among others, numbers from Bach’s Christmas Oratorio, Gaudete, Cantique de Jean Racine, O Holy Night, Chestnuts Roasting On An Open Fire, The Twelve Days of Christmas and a delightful combination of The First Noel and Pachelbel’s Canon, all with superb accompaniment from pianist Christine Langton.